How many teachings had I heard on the power of my words? On my identity in Christ? How many books had I read? Scriptures had I learned? Why? How would this be any different? I will try. What do I have to lose? Standing in front of the mirror, paper in hand, trying to reconcile in my mind how these words can possibly be thought, much less said about me. I look down at the words then back in the mirror, the words, the mirror. Will this change anything in my messy, miserable life? How can these words even be true for me, of me, after everything I have done? All the mistakes, the sin, the guilt. “I am loved unconditionally.” I struggle to state the first Truth out loud. I know in my head this is Truth – what the Bible says, what I have heard in sermon after sermon, have read in book after book. Yes, it’s in my head – head knowledge. But definitely not in my heart, it’s not heart knowledge. Not yet. The words seem shallow, meaningless, yet powerful, piercing at the same time. This is not just positive self-talk, not self-affirmation. This is Truth – divinely spoken, God-breathed words – whispered over my life. Imploring me to believe, to know, to understand, to live and walk out what God says about me. What Jesus died to give me. It’s like a speaking a foreign language, one that my spirit knows but my soul can’t quite process or understand. The words are not natural. No, they are supernatural, life-giving. Speaking these words stirs up conflict within. Bitter but sweet, frustrating yet freeing. Tearing down strongholds while building hope. 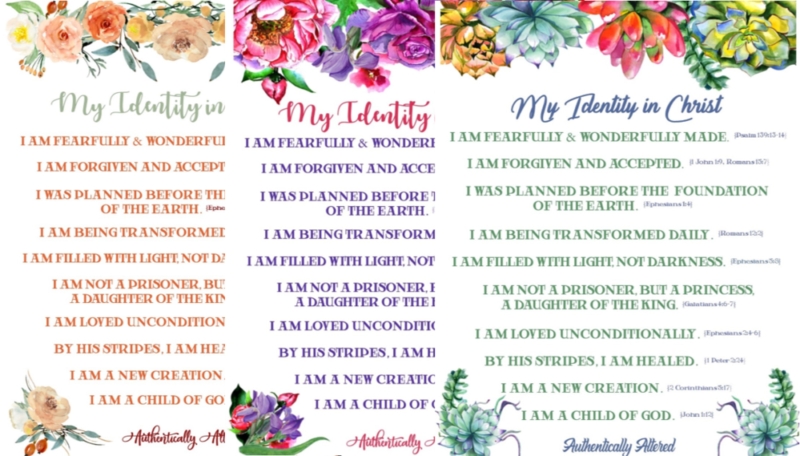 Looking in the mirror reading this daunting list of who I am in Christ feels like such a contradiction to my current reality! It feels like such a lie. Ah, yes, my feelings… I have let my feelings become my reality, my truth. Allowed them to dictate my actions, thoughts, and attitudes. This, this is partly how I got here. How and why I view my life as a discontented, frustrated, downcast mess in the first place. Granting my emotions, my feelings – my mind and flesh – permission to have authority over my life. I had no idea how difficult it would be to speak these Truths out loud, much less while staring looking at myself in the mirror. Many days I didn’t get through the entire list. Some days I barely got two Truths out before the tears or frustrations started to well up. The words were so contrary to my feelings, my attitude, my circumstances. But I had made a commitment to speak these words, these promises, these Truths over myself for 30 days. I was going to follow thru. Words have power! We have all experienced their power. Think about how a few words can either make your day or break your heart. How hearing a story or reading a card can evoke a whole range of emotions. Words can shift your perspective or change your current circumstances in the blink of an eye. Yet we throw them around ever so carelessly sometimes. Proverbs 18:21 cautions us life and death are in the power of the tongue. The Message translation states it like this “Words kill, words give life; they’re either poison or fruit—you choose.” Your words, my words, our words have power. Our thoughts also have power. After all, they are made of words, right? And even though they are not spoken out loud, our thoughts are “heard”. They are our own internal dialogue. Statistics vary widely, but supposedly we have between 12,000 and 60,000 thoughts per day, 70 – 80% percent of them negative, 90 – 98% the same thoughts we had yesterday. A plethora of (negative, repetitive) internal chit-chat. According to other statistics we speak about 16,000 words a day. And hear all the words spoken by others. Add in all the words we read via computer, smartphones, and on paper and the thoughts, made of words, listed above. WOW… every day we are bombarded with a barrage of words containing a tremendous amount of power. 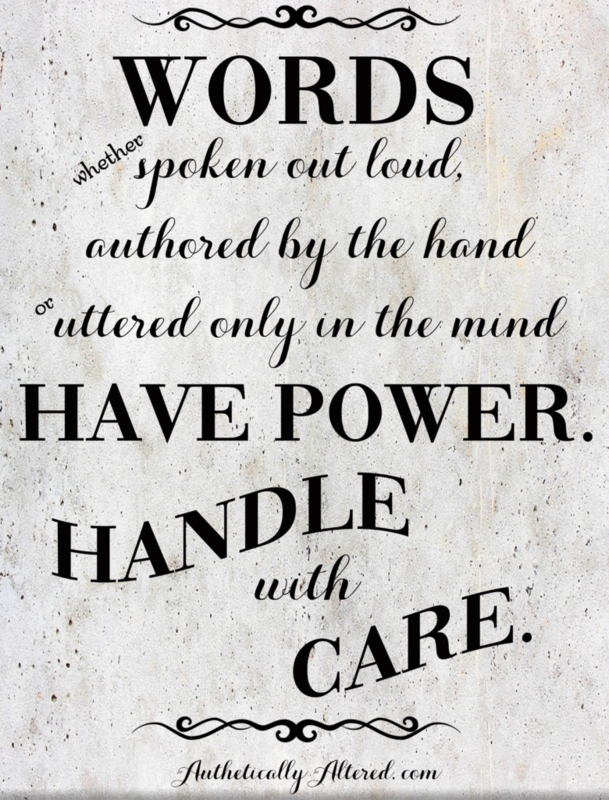 Words – whether spoken out loud, authored by the hand or uttered only in the mind – have power. Handle with care. Where do all these words come from? They come from within us. Luke 6:45b tells us the mouth speaks for the overflow of the heart. I would say the mind also speaks from what is in the heart, what is in the soul. If you want to know what is truly in your heart, pay attention to your words and your thoughts. They will both eventually bear the fruit of what we are planting in our hearts. 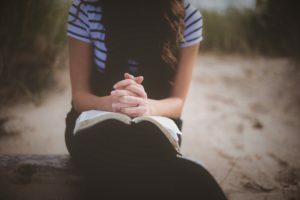 What happens when we are not planting Truth in our hearts, not depositing God’s Word in our minds? Other sources – outside and in – sow untruth. Filling our hearts and minds with the lies of the enemy and the lies and distractions of the world. With thoughts and words of criticism and comparison. Of selfishness, pride, and fear. We will let feelings and circumstances dictate our attitudes, actions, words, and thoughts, instead of letting God’s Truth guide us. If our thoughts are polluted with lies, with untruth, playing on repeat – over and over, day after day – those lies become our perceived reality. We walk around frustrated, discouraged, filled with negativity. Living a shoulda, coulda, woulda life – overwhelmed by unmet expectations, disappointments, and resentment. This is why 2 Corinthians 10:5 calls us to take EVERY thought captive to the obedience of Christ, to the God-given authority deposited in us by the Holy Spirit. When we examine our words and thoughts under the light of God’s Word, we can align them with His Truth. During those 30 days, and still now as I read the Truths of my identity in Christ each day, God has revealed Himself to me and exposed many lies I was believing. I vividly remember looking this Truth one morning “I am God’s Masterpiece.” [Ephesians 2:10] and I could not repeat that while looking at myself in the mirror. Why was this so hard for me? Only yesterday, I had prayed with and spoke this Truth and scripture over a friend. Do I believe it’s true or not? If no, am I saying I don’t believe any of it? In Jesus? In my salvation? In any of God’s Truth or promises? Or I just don’t believe it for me? And if so why not? Why am I excluding myself for the love and grace that I share with others? Because it was in my head – I knew what the Word said – but it was not my heart. I could talk the talk but I was not walking the walk. I realized then I had to start not only knowing what the Word said but believing and doing what the Word said. I had to believe, not just in Jesus, not just my salvation. But I had to believe ALL of the Word, every single Truth, all of God’s promises and all that I have in Christ. No more just reading and listening. I had to talk the talk AND walk the walk every day. Another revelation happened when finally began to grasp the depths of God’s love and His omnipotence. Again, I had heard this, read it, would speak it over someone else. Until I started planting these Truths in my heart every day, it was like it didn’t apply to me. I had believed the lie. But no more!! My head AND heart now knew God knows and sees all things for all time. He knows every sin, every flaw, every mistake and every weakness. He weaved them into my story, into my destiny, into my testimony before the beginning of time. God gives us free will, but He also plans for the choices we will make. All things are used for His purpose, even the wicked and evil in the world [Proverbs 16:4]. The fruit of what God planted in my heart because of my weaknesses and struggles can possibly make difference in someone else’s life. They may decide to take a chance and let God transform them. And then the consequences ripple across time. I know it is much easier said than done, but if we can view our struggles and weakness from this perspective. If we allow them to be God filtered, He will work all for His glory [Romans 8:28]. I had no idea how challenging “facing” my broken identity would be. I also did not grasp how much restoring my true identity, my identity in Christ would alter my life. Storing up God’s Word in my mind and heart initiated an ongoing transformation – in my health (mental, physical and spiritual), in my marriage – in every aspect of my life. I now have head knowledge AND heart knowledge, confirmed in His Word, of what God thinks and says about me. Of who I was planned and designed to be. Of my identity in Christ. God can and will do the same for you. If you struggle with fear, anxiety, or low self-esteem. If you doubt or question who you are – who God says you are, who you are in Christ. Start planting God’s Word in your heart by speaking His Truths to and over yourself in the mirror each day. Pretty printables to help you get started! Click to access Subscriber Library!! Click HERE to subscribe to email list & get access to Subscriber Library! Post one on your bathroom mirror, bedroom mirror – somewhere you will see it every day. Then read these Truths from God’s Word over yourself while looking in the mirror every day for 30 days. I believe God’s Truth and knowing your identity in Christ have the power to transform you inside and out. If you decide to try speaking Truth over yourself for 30 days, please comment below or email me at angela@authenticallyaltered.com and let me know. I would love to pray for and encourage you during the 30 days. Then be sure to check back in after 30 days (or anytime) with an update on what God is doing in your life!! If you have questions about accepting Jesus as your Lord and Savior, please email me at angela@authenticallyaltered.com. I LOVE THIS! Such wisdom in your words! The printable’s are extra cute!!! So glad you enjoyed it! Thank you for the encouragement!! Angela this is awesome!! I have been teaching others how to Speak in the mirror for years and it is amazing how difficult it is to look your self in the eye and make those declarations over yourself!! This is so good!! Angela this is awesome! I have been teaching others for years how to speak in front of the mirror and make these declarations over them selves. It is amazing how difficult it is to look yourself in the eyes and make these declarations over yourself!!! Yes, it is difficult but makes such a difference!! Thanks, Jen for the encouragement!! This is amazing and I know that many hearts will be touched by your words. This is so good Angela! Thank you Elizabeth!! So glad you enjoyed it. Thank you for the encouragement. So glad this ministered to you Barb!! It is a journey. One I also continue every day. Keep pressing!